The trendy and industrial look of this "L" shaped Glenlivet computer desk will be the focal point in your modern home office. 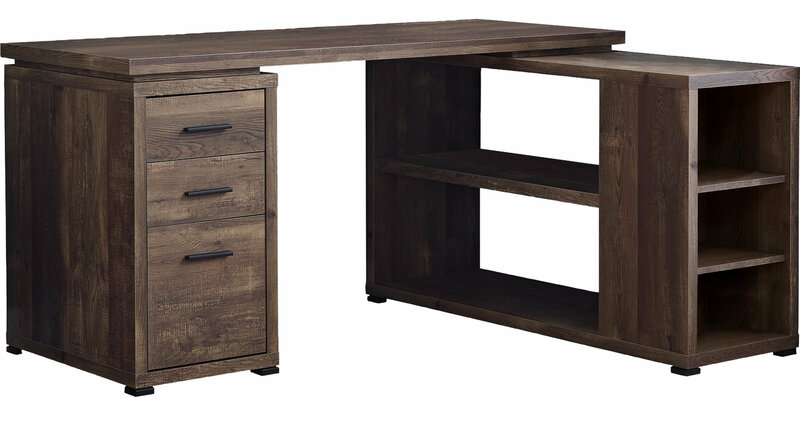 This simple and stylish desk features thick panels and clean lines in a warm brown wood grain look. The desk portion offers a spacious work surface that is great for doing paperwork or working on your computer. It also features two medium storage drawers and a convenient lateral file drawer on metal glides to help keep you organized. The secondary surface can be assembled on the left or right hand side of the desk and offers additional workspace with adjustable shelves. The black handles and feet boldly accent this L shaped desk making it a must have for any home or office space.